Cyprus Subsea Consulting and Services Ltd (CSCS) is contributing to advanced Sea Traffic Management systems by providing expertise for the development of efficient port management tools and innovative monitoring and forecasting systems for reducing the risk and impact of accidents, through the recently inaugurated project STEAM (Sea Traffic Management in the EAstern Mediterranean). 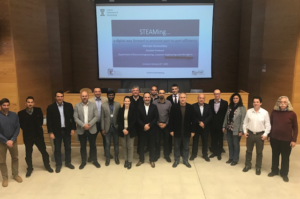 STEAM is a three-year project led by the Cyprus University of Technology (CUT), starting on January 1st, with a budget of approximately 1 million EUR, funded under the Cyprus Research Promotion Foundation’s “Integrated” projects. a driver for short sea shipping in the Eastern Mediterranean through enhanced services based on standardized ship and port connectivity. The Kick-Off meeting of STEAM took place on February 26th, at the Cyprus Technological University (CUT), Limassol. The meeting was attended by all partners, who are established maritime stakeholders of the quadruple helix: research/academic institutions (CUT), private enterprises (TOTOTHEO, DELEVANT, CSCS), public authorities (Cyprus Port Authority), and civil society organizations (Cyprus Shipping Association), as well as the Sweden’s research institute and innovation partner, RISE. The STEAM project is based on the foundations laid out by the EU Sea Traffic Management (STM) Validation Project, through which the concept of a Collaborative Decision Making system for ports (PortCDM) is currently being validated in 13 ports of Europe, including the Port of Limassol. In the STEAM project, the implementation of the STM concept will be significantly extended and enhanced through the creation of a PortCDM information platform that will serve as the main tool for the collection and analysis of relevant data for the efficient management of the Limassol port. Cyprus Subsea Consulting and Services C.S.C.S. Ltd (CSCS) was founded in December of 2012 in Nicosia, Cyprus. The company blends academic and technical expertise, seagoing and survey experience to carry out research, commercial and governmental projects in the Eastern Mediterranean Sea, the wider Middle East region, as well as Europe and North America. Since its beginning, CSCS has been serving the public and private sector with equipment maintenance, rent and official resales, as well as data collection, analysis, and reporting services. CSCS specializes in marine robotics and autonomous systems, such as gliders, AUVs, ROVs, moorings, and landers as well as operational forecasting and observing systems. CUT is an established public university, founded by law on December 2003, and one of three state universities in Cyprus. CUT is a dynamic university with six leading schools/faculties and 10 academic departments, able to offer education and high level research, in primary branches of science and applied technology, at Undergraduate and Postgraduate levels. According to the Times Higher Education World University Rankings, CUT is the youngest university in the list of top universities in Europe; an achievement that highlights the emerging, dynamic, and innovative nature of CUT.